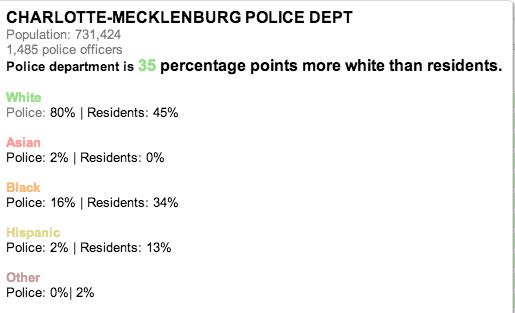 The author used Tableau Public to show disparity in racial makeup of police departments in various towns in North Carolina -- and how that related to the population's racial mix. This post originally appeared on The Future of News. "Even if we acquire, clean and produce data along with some simple story guides, data driven journalism may still not find its way into smaller newspapers if nobody is there to receive our help." Being a words guy rather than a picture guy, I used data visualization software Tableau to put together a prototype of something similar to what The Times had done. It is absolutely nowhere near as good as what they did, but I copied their concept, color scheme and fonts. And about two hours later I had something that told the same story. Ryan Thornburg researches and teaches online news writing, editing, producing and reporting as an assistant professor in the School of Journalism and Mass Communication at the University of North Carolina at Chapel Hill. He has helped news organizations on four continents develop digital editorial products and use new media to hold powerful people accountable, shine light in dark places and explain a complex world. Previously, Thornburg was managing editor of USNews.com, managing editor for Congressional Quarterly’s website and national/international editor for washingtonpost.com. He has a master’s degree from George Washington University’s Graduate School of Political Management and a bachelor’s from the University of North Carolina at Chapel Hill.